The Park Avenue Bridge cost $83,687.67 to build in 1904. Mrs. Felix Fuld donated the Cherry trees to the park. Concerts were held in the summer while visitors relaxed on blankets. 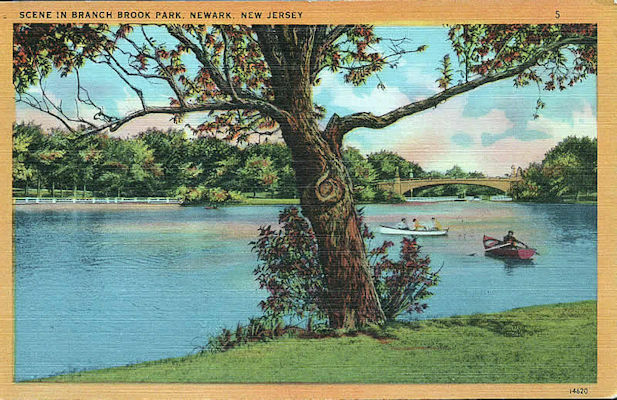 One of the most delightful and pleasing of Newark's Parks is known as Branch Brook Park. It is situated near the geographical centre of Newark and contains 280.62 acres. This park is a long narrow strip of land varying in width from 685 feet to 1,755 feet. The average width of the whole park is 1,175 feet, while its total length is 11,115 feet. In other words, Branch Brook Park averages less than a quarter of a mile in width, while it is over two miles long. The land and the structures that were on it which were subsequently removed, cost $1,225,622.83. The park improvements cost $1,412,443.71. In it there are 4.25 miles of roads and eleven miles of walks. Under the personal supervision of the Park Commissioners and their energetic secretary, landscape architects, engineers and general park builders, the park which occupies the bottom of a valley sloping upward to its eastern and western boundaries was made one of the garden spots of the state. In a general way it is made up of three divisions. The "southern" and "middle" divisions are connected by a subway under Park Avenue, a public thoroughfare running east and west through the park, and under another avenue further north - Bloomfield Avenue - another but smaller tunnel connects the paths and waterways of the "middle" and "northern" division. In draining and improving this property sufficient water was encountered to create two lakes - one for the "middle" and one for the "southern" division with a surface of about 23 acres. In the "southern" division a boat house has been erected, and facilities are thus afforded for canoeing and rowing in summer, and skating in the winter. The length of the water surface is about 4,000 feet. The "middle" division contains a wading pool for children and an athletic field of 14.8 acres for small boys. The "northern" division has been developed in a manner less formal than that of the others. It possesses many fine trees which were on the property when it was purchased, and which, unfortunately, were almost lacking in the other two divisions. A large plantation of rhododendrons has been set out in this section and here also, mountain laurel has been introduced. In this park there is a fine collection of English gorse and Scotch heather. In the northern division are tennis courts, cricket grounds and ball fields 41.64 acres in size. Through the entire length of this division runs a brook which is fed by water pumped form the lakes. Here also are the greenhouses in which are grown the flowers for summer use throughout the park system, and where every fall there is an exhibition of chrysanthemums and begonias. The division contains 125.26 acres, of which much was given to the county by the following public spirited citizens: William A. Wrighter, Charles William McAndrews, Zebulon M. Keene, Robert F. Ballantine and the estates of Peter H. and John H. Ballantine and the Prospect Heights Improvement Company. One of the pleasing features of this park is the Ballantine Gateway, at one of its eastern entrances. This cost $27,895.25. It was presented to the county by Robert F. Ballantine, who was for four years, and until his death, a member of the Park Board. The heirs of the late Aaron Peck gave to the county a four-fifths interest in fifty-two lots in the "middle" division. The United Singing Societies of Newark in 1903 presented to the county a fine heroic-sized bust of Mendelssohn on a granite pedestal. This occupies a place in the "southern" division. That division is the garden of the park. On the eastern side of a large lake are beds of hardy flowers which present a continuous bloom from the early crocus and tulips of spring to the cosmos of late fall. On the Western side of the water is the concert grove and band stand. Here also is a children's playground and sand court, and nearby is a running track, and athletic grounds for boys and men. For them suitable toilets and locker rooms are provided. Branch Brook Park is part of the extensive park system of Essex County, which already has a total acreage of 3233 acres. The system is under control of a Park Commission, with authority to locate parks throughout the entire county, unlimited by the confines of single municipalities. In point of fact, four of the Essex County parks comprise portions of several municipalities. Branch Brook Park comprises a tract of 280 acres, lying in what was formerly a low and swampy valley, between two high ridges, where the surface water collected in stagnant pools. The whole locality was a breeding ground of frogs and mosquitoes, and was locally known as Old Blue Jay Swamp. Branch Brook Park has completely change all this. In place of stagnant pools, is a brook of pure running water, widening into occasional pools and ending in two large lakes, with a combined area of 23 acres. Near the southeast corner of the park, and dominating the landscape from the highest ground in the neighborhood, stands the imposing, but as yet unfinished structure of the new Roman Catholic Cathedral of the Sacred Heart. Nearby, bounded by 6th Avenue, Parker and Bridge Streets is the Barringer High School.